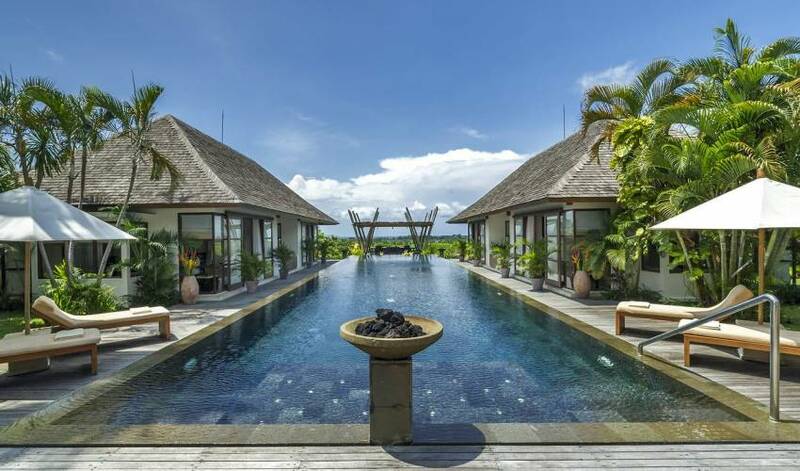 With panoramic views over luxuriant rice paddies stretching all the way to the Indian Ocean, Villa Mandalay provides a lavish, exotic hideaway on Bali’s scenic south-west coast, only a few minutes’ drive from Tanah Lot’s dramatic sea temple and award-winning golf course. With the option of renting either four, six or seven bedrooms, this spacious villa provides ample space for families and groups of friends. Sweeping lawns fringed by lush tropical gardens framing a picturesque backdrop also make the villa ideal for wedding parties. Highlights include a 25-metre swimming pool, fun ‘pitch and putt’ golf course, sauna and a friendly and professional staff team including a personal chef who is master of an extensive suggestion menu. 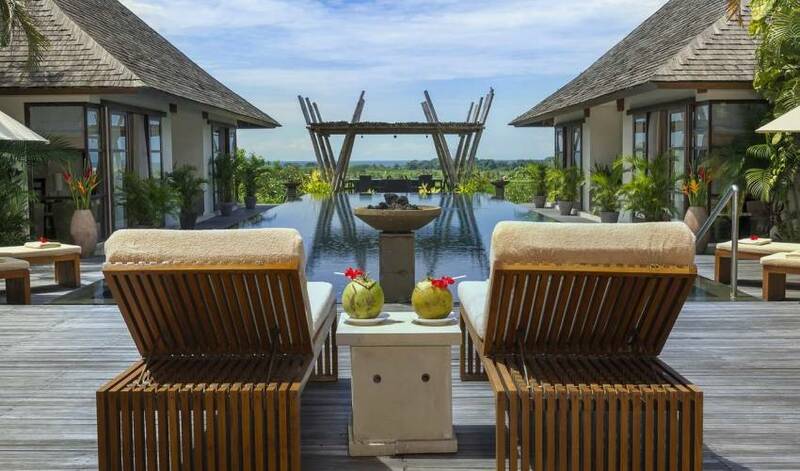 It is said that green is soothing for the soul, so with its glorious location overlooking acres of emerald rice fields stretching to the tropical turquoise ocean beyond, a stay at Villa Mandalay promises to be a serene one. The villa’s tranquil setting is enhanced by a perfectly balanced contemporary design, with 25 metres of green-stone-tiled swimming pool creating a magnificent focal point. Buildings of creamy stone, with ironwood shingle roofs and rich dark timber accents, provide luxurious living and sleeping areas for up to 14 people. 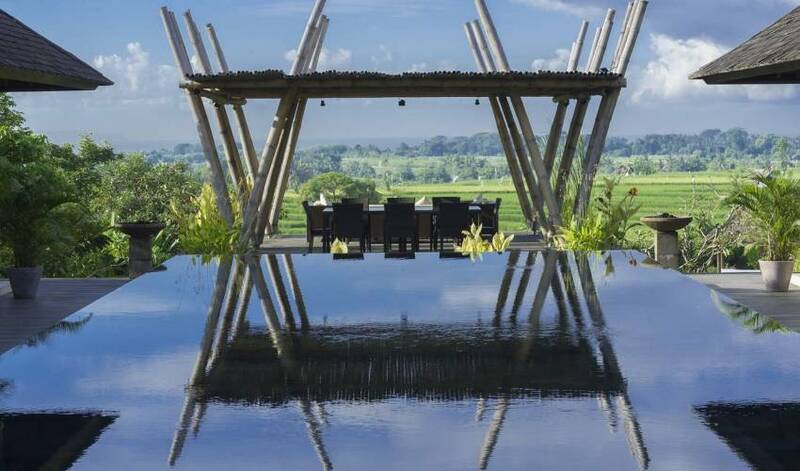 An enchanting bamboo pavilion ‘floating’ on a water garden grants unobstructed views and creates an atmospheric setting for casual breakfasts, sunset cocktails and candlelit dinners. Gorgeous gardens filled with frangipani, calla lilies and heliconia add swathes of colour, while lively fish ponds complement the tropical scenery. 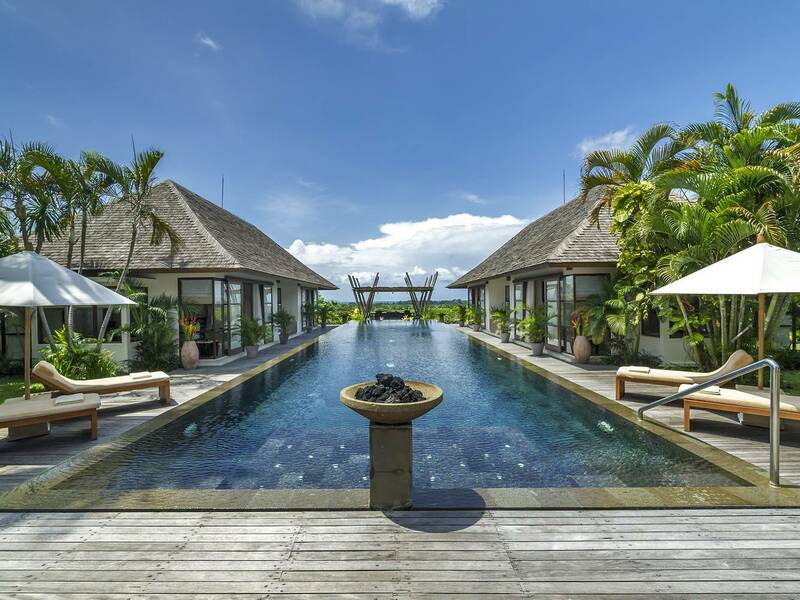 Indonesian artwork adorns the villa, with a strong avian-theme reflected in Balinese paintings, and colourful carved wooden statues from Kalimantan, alongside elaborate friezes and a fascinating display of ethnic artefacts. 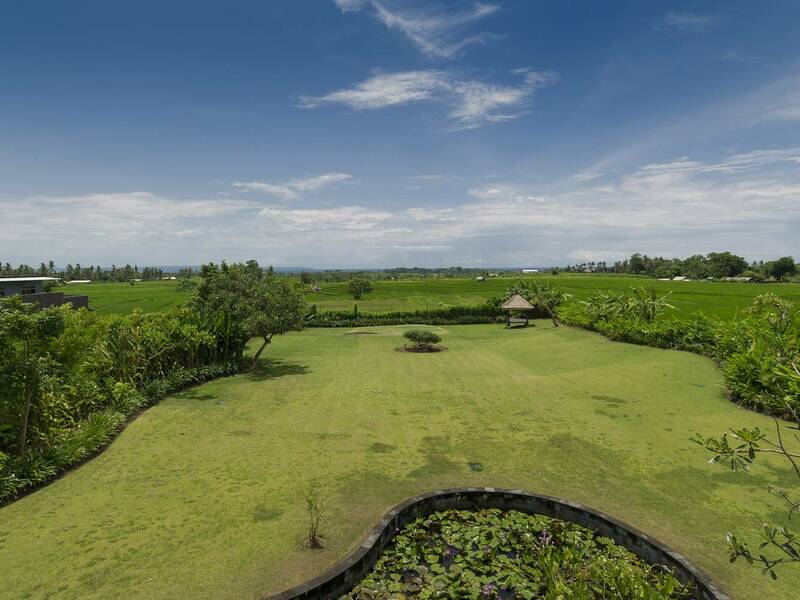 Golf enthusiasts will love the six-tee ‘pitch and putt’ golf course set into the lower gardens, and the villa’s proximity to the multi-award-winning Nirwana Bali Golf Course, which hugs the rocky coastline and offers stunning views over the venerated sea temple of Tanah Lot. Those wanting to relax can take a leisurely stroll along the glistening black-sand beach at Seseh, soak up the warmth of the Finnish-style sauna, or enjoy a soothing massage in the garden bale (pavilion) provided by a skilled therapist from a reputable local spa. Friendly staff include a talented chef who prepares Western and Asian meals from a comprehensive suggestion menu, as well as sumptuous Balinese-style feasts. A car and driver is also on hand (additional charge) to whisk you away to island attractions such as the sunset bars and restaurants of nearby Echo Beach, the galleries and ornate Hindu temples of Ubud, or a world-class shopping and dining experience in Seminyak. A stepping-stone path leads across a flourishing lily pond to the entrance of the villa, whose symmetrical design creates a tasteful and elegant ambiance. 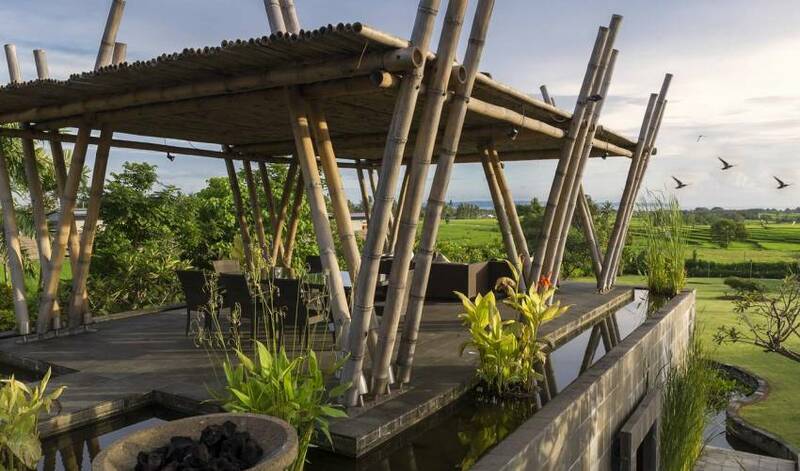 Single storey contemporary Balinese-style pavilions are arranged in a U-shape around a long rectangular swimming pool, with two guest bedrooms bordering each side and the two master suites flanking the main living and dining area. Stairs lead down to a studio bedroom adjacent to the sauna overlooking the ‘pitch and putt’ golf lawns. 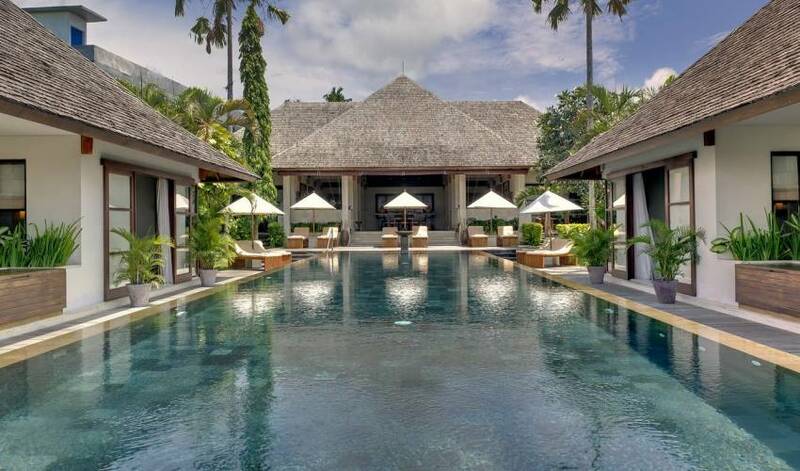 The villa’s entrance is dominated by a large Palimanan stone frieze flanked by elegant Javanese statues, leading to the fan-cooledliving and dining pavilion with its wooden floors, soaring ceiling and evocative Indonesian artwork. A glass-topped dining table seats 12, with an additional small table seating four. Large alcoves on either side have built-in sofas upholstered in earthy hues, and coffee tables strewn with magazines. A bar at the back is equipped with an iPod dock and surround-sound system, while ethnic artefacts are displayed against a red feature wall. A guest washroom lies to one side and on the other is a kitchen equipped with everything required to cook up a storm. The steep sloping rattan ceilings of the mezzanine media room create an atmospheric air-conditioned space for reclining on mattresses and cushions, and watching the 62-inch TV and movies with surround-sound. Shelves are filled with DVD’s and novels. 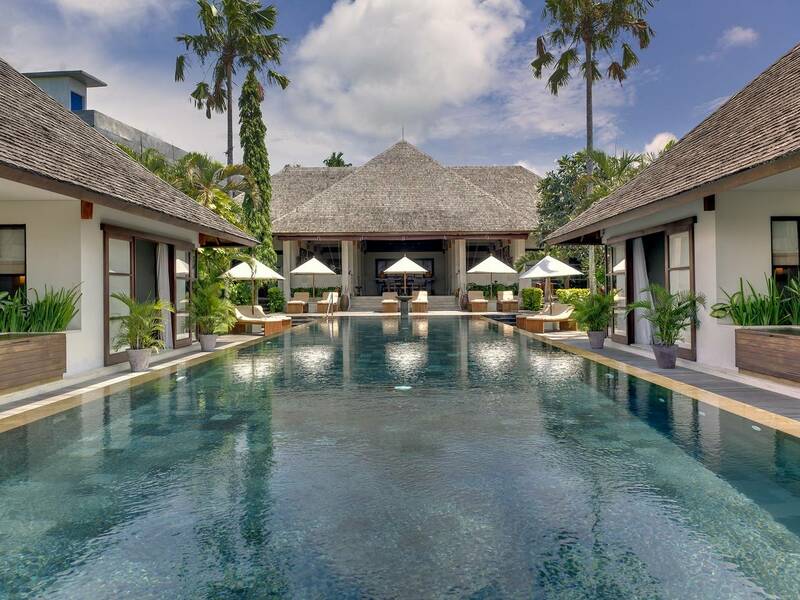 Steps lead down from the living room to the 25-metre swimming pool tiled in green stone and surrounded by sun loungers shaded by stylish parasols. Walk along the timber deck to the atmospheric bamboo bale pavilion set in water gardens flourishing with brightly hued calla lilies and colourful fish. 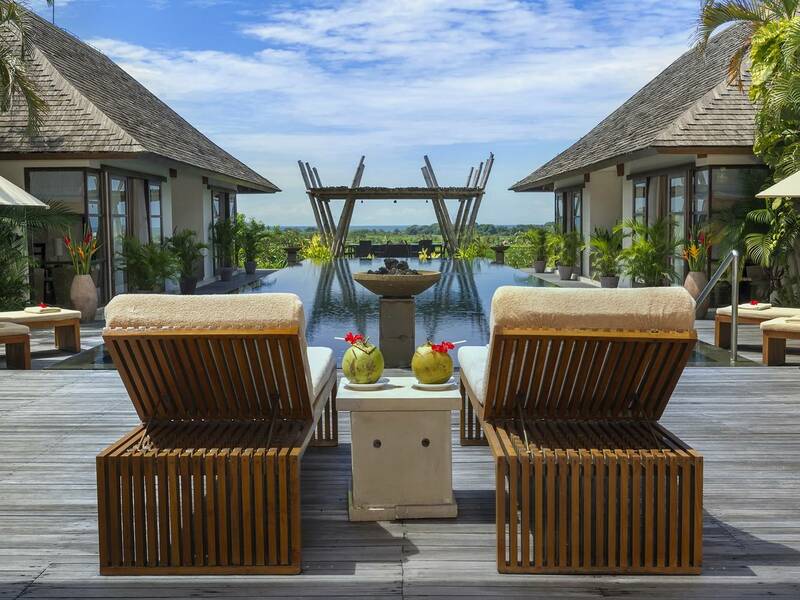 Furnished with a dining table, eight chairs, and comfortable rattan lounge suite, the bale offers stunning rice-terrace views stretching towards the ocean. Descending to the lower level and adjacent to the studio bedroom, the aroma of cedar wood awaits in a full-sized Finnish-style sauna with lovely garden outlook, and a separate shower room. 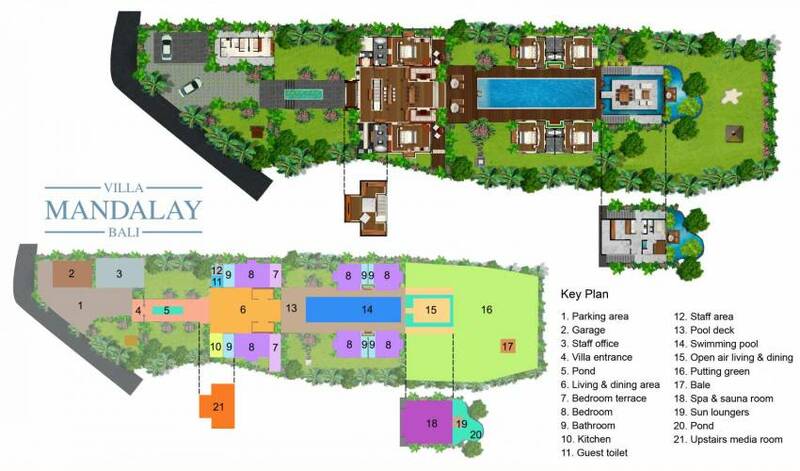 The whole property is ringed with flourishing foliage, from frangipani to palms, and birds of paradise flowers. 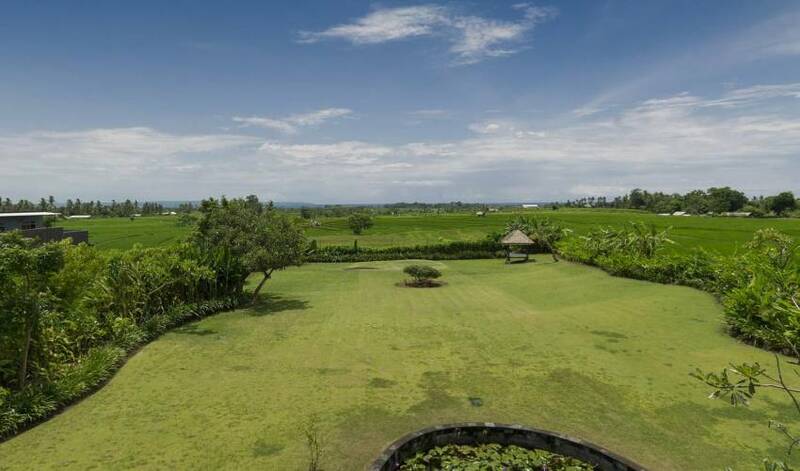 The six-tee pitch and putt golf course is laid out on perfectly manicured lawns but gives the sensation of being right in the middle of the rice fields. Athatched bale (pavilion) at the far side of the garden provides a place for peaceful respite. All bedrooms are air conditioned, with ceiling fans, king-size beds furnished with crisp white linens and flat-screen TV’s with DVD players. Walk-through dressing rooms lead to stately ensuite bathrooms tiled in grey andesite stone, with twin vanities (except for the studio), statue-filled alcoves and customised amenities. Two generously sized master bedrooms flank the living room, identical but for their artwork. Ceilings are gracefully tiered and softly illuminated in the evenings, long wooden desks nestle in window alcoves with garden outlooks, and each has a timber deck encircled by hedges and flower boxes, and furnished with a table, chairs and daybed. Large bathrooms include separate his-and-hers vanities and oversize terrazzo bathtubs. 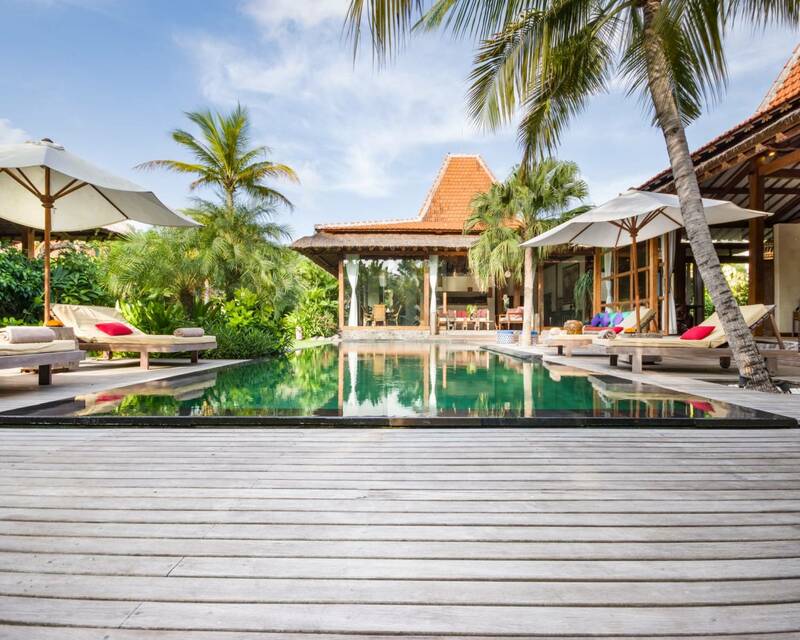 The villa’s four guest bedrooms are arranged around the swimming pool, opening onto timber decking at the front and to gardens at the back, via sets of glass doors. 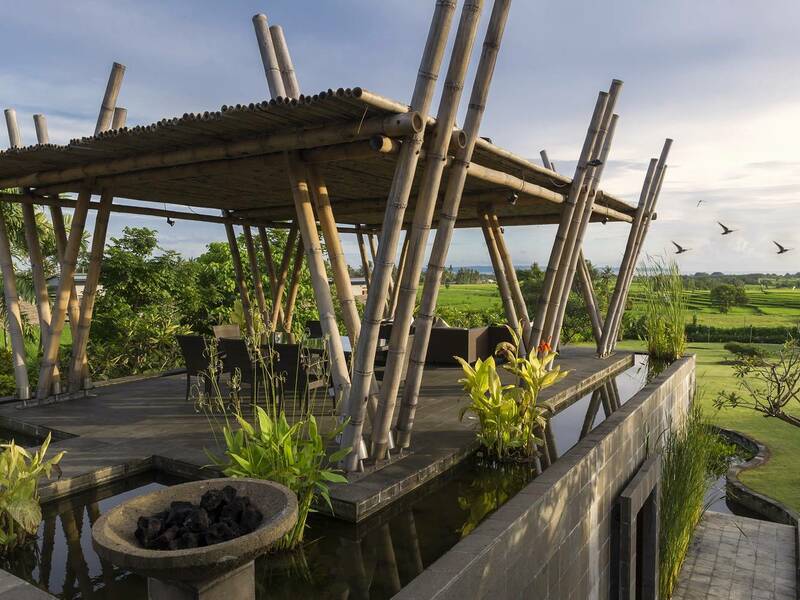 Two of the rooms have views over the lush rice fields, and are fitted with attractive window seats from which to enjoy them. The other two rooms have window alcoves with built-in desks overlooking tropical gardens. Tucked away below the main villa, at garden level, the studio is the most private of the bedrooms (although slightly smaller than the others) and has an enchanting timber deck, furnished with sun loungers, set on a thriving lotus pond. The bathroom is tiled in gleaming Indian stone, with a single vanity and walk-in shower. This room is adjacent to the sauna. 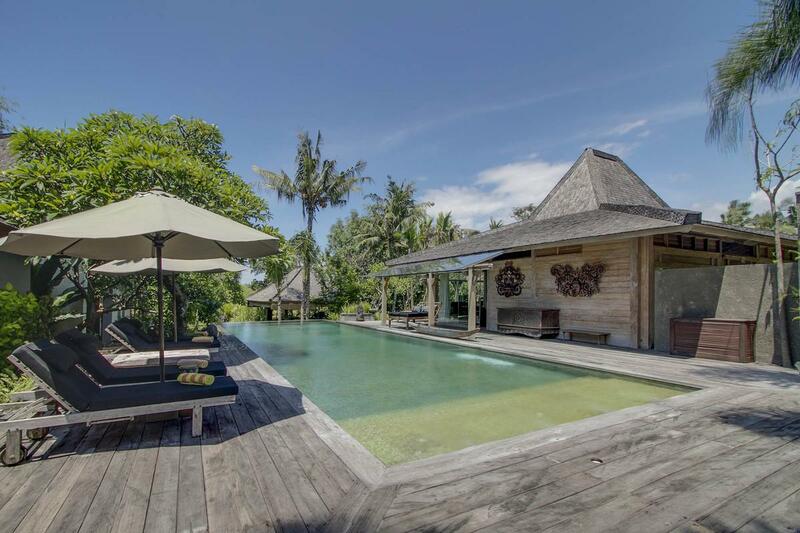 Villa Mandalay boasts a beautiful rural Balinese setting in the tiny village of Munggu, close to Seseh Beach and Tanah Lot. 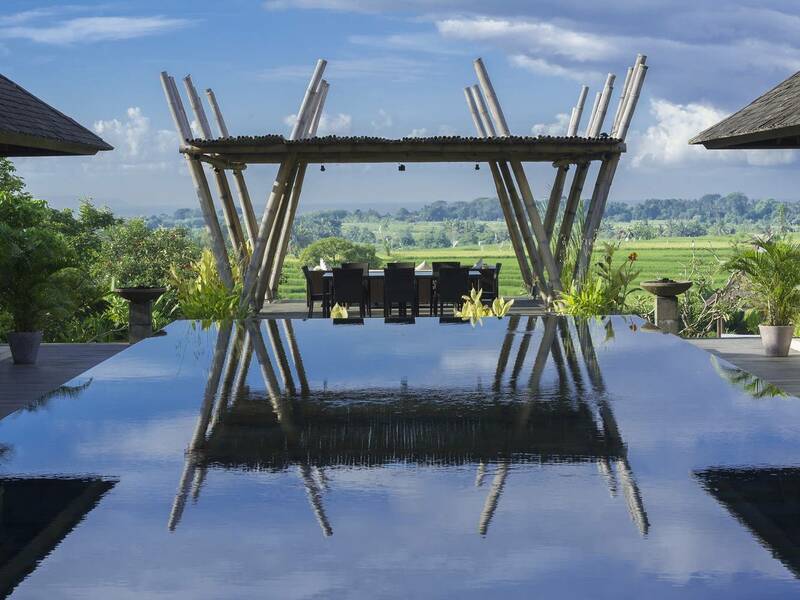 The villa looks across acres of rice-fields, unchanged for centuries, and onwards to the glinting Indian Ocean, just 3km away. A scenic stroll or short drive will bring you to the black sands of Seseh Beach, while the iconic Tanah Lot sea temple, international-award-winning Nirwana Bali Golf Course and neighbouring Pan Pacific Resort, which offers a number of good restaurants, are all close by. 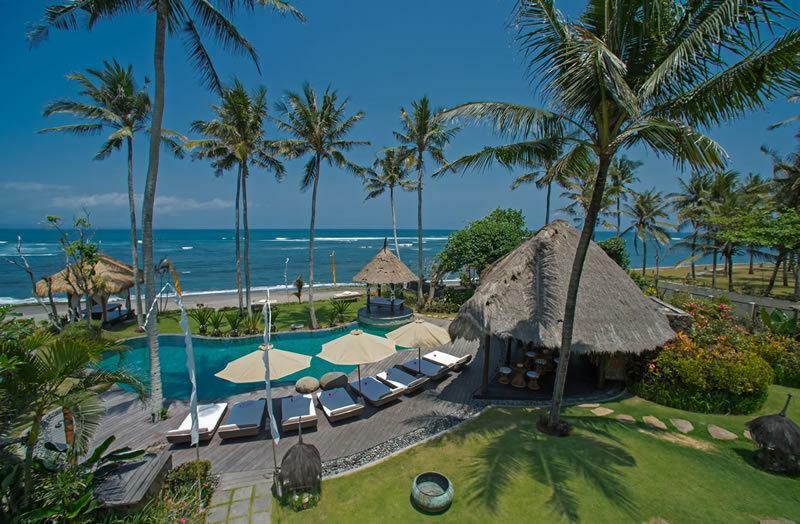 Many new interesting cafes, beach bars, restaurants and boutiques are springing up along the beach roads of nearby Canggu, and cosmopolitan Seminyak is just 13km from the villa. A car and driver is available to guests at a reasonable daily rate.